The detailed Spitzer Space Telescope view above features infrared light from dust (red) and old stars (blue) in Andromeda, a massive spiral galaxy a mere 2.5 million light-years away. In fact, with over twice the diameter of our own Milky Way, Andromeda is the largest nearby galaxy. Andromeda's population of bright young stars define its sweeping spiral arms in visible light images, but here the infrared view clearly follows the lumpy dust lanes heated by the young stars as they wind even closer to the galaxy's core. Constructed to explore Andromeda's infrared brightness and stellar populations, the full mosaic image is composed of about 3,000 individual frames. Two smaller companion galaxies, NGC 205 (below) and M32 (above) are also included in the combined fields. The data confirm that Andromeda (aka M31) houses around 1 trillion stars, compared to 4 hundred billion for the Milky Way. 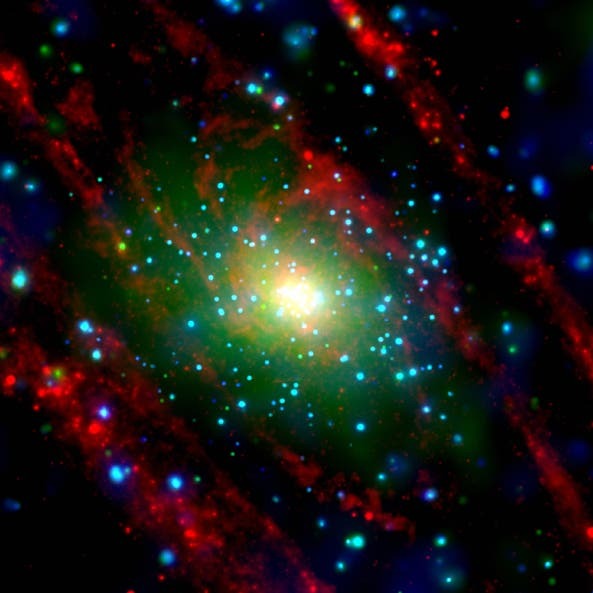 The Chandra X-ray image below shows the central portion of the Andromeda Galaxy. The blue dot in the center of the image is an unusually "cool" million degree X-ray source of unknown nature. Just above this cool source is a source (yellow) that is thought to be due to X-rays from matter swirling toward a supermassive black hole in the nucleus of the galaxy. This black hole contains the mass of 30 million suns. Numerous other X-ray sources are also apparent. Most of these are probably due to X-ray binary systems, in which a neutron star or black hole is in a close orbit around a normal star.